This year XANT will broaden its product portfolio with the new XANT L platform, taking the XANT USP’s to the 250-330kW power level. 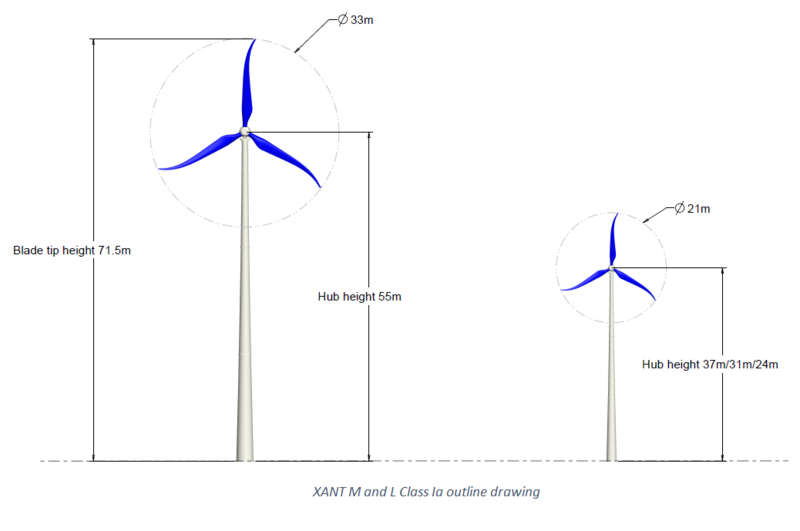 The XANT L extends the suitability of the XANT turbines into the MW-size range and for larger off-grid projects that require more installed wind capacity, the XANT L will be a more obvious choice than its smaller brother. For behind-the-meter customers that have electricity consumptions in the 0.5-5GWh range, the XANT L is ideally suited as a distributed-generation production unit. Annual Energy Yield will be in the 500…1000MWh per year, depending upon wind-speed, while the footprint will be similar to the XANT M.
The XANT L will build upon the same proven design concepts as the XANT M: Just-Enough-Essential-Parts to keep the turbine simple and robust but thanks to aero-elastic tailoring and powerful control algorithms highly efficient and performant. Although larger to handle, the requirements regarding heavy equipment to install and erect the turbine will be kept to a minimum. The drive-train will be identical to the XANT M: a direct-drive permanent magnet generator, a stall controlled down-wind rotor, 100% power conversion. A mere scaling-up of the XANT M will not suffice however. To keep the unique features of the containerized transport and crane-less erection, the XANT L had to beat the so-called “square-cube” law: the power rating of turbine increases with the square of the rotor-diameter, but the mass of the components increases with the cube of the rotor-diameter. So as turbines become larger, they become proportionally heavier. Wind turbine design starts with aerodynamics: the selection of the appropriate airfoils is key to a successful wind power product. XANT collaborates with some of the leading research institutes in wind energy, using their vast knowledge of airfoils to pick the best ones all along the span of the XANT L blade. Low torsional stiffness for enhanced bend-twist coupling, roughness insensitivity for maintaining aerodynamic efficiency even after long periods of operation without rain, soft-stall behavior for smooth power output. These are just some of the requirements put forward in the selection process. After an initial scan of most of the airfoils available, a short-list was compiled based on aerodynamic properties (lift and drag coefficients). 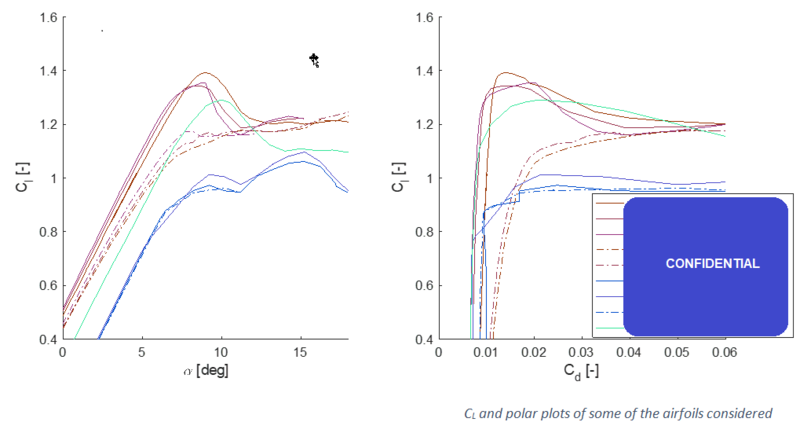 Next, blade-element momentum (BEM) calculations started using the HAWC2 aero-elastic code with the selected airfoils to compare performances and loads. The final step in the design of the structural parts is the detailed dimensioning of the structural elements using Finite-Element Analysis (FEA) tools. The XANT team expects to finalize the design phase by this summer and start sourcing the components for the first XANT L turbine in Q3-2018. An operational prototype is expected by Q1-2019. XANT is excited to bring this new machine to the market. Capitalizing on the track record built up with the XANT M in the most extreme conditions from Alaska to Vanuatu, the XANT L will be the big brother the M always wanted.